Terry Rue is one of the friendliest and most openhearted foosball players I have ever met. When you walk up to him you instantly feel appreciated and accepted and he has a remarkably positive aura. At the same time, he is just a brilliant and fair player at the table. His ballhandling skills and trickshot aresenal are amazing. His determination almost lets you feel the intensity and the passion he brings to the game. Just watching him is quite an inspiration for you own attitude toward the game of foosball. That is why I feel highly honored to get an interview from him! How and when did you start playing foosball and what was your main motivationto keep playing and improving? In my home town, we had a skating rink which had two foosball tables. It was the place where kids hung out. The skates made us taller and allowed us to see over the sides of the table. I think I was 5 or 6 years old when I crudely played my first game of foosball. As I grew into a teenager, my game progressed and I had knack for cool shots. The older boys sneaked me into pubs to play with them and they bet money on me. My limited view of foosball changed when I enrolled as a pre med major at our local college. One day during a break, I found a game room named Quarter Till. When I walked in I saw multiple foosball tables and I witnessed a purposeful five man and game plan for the first time. The owner of the game room, Harry, introduced me to the structure of the game and gave me the basic tools, which I still use today. I was introduced to foosball players which are lifelong friends now. This is where I was introduced to tournament foosball and the professional tour. That was motivation enough, haha. My current motivation is my daughter Sullivan. She is amazing and her wonderful personality and glow is infectious. Also, what I have seen this week at the World Cup has set a fire in me. Multi table tourneys rock. 2.Who is the player you learned the most from? Todd Loffredo was the main guy in the beginning. I remember following him around watching all of his matches and game time decisions. Over the years we became good friends and he showed me concepts of setting someone up for a shot or a block earlier in the match and then capitalize on your chess move when it really counts. That’s what clutch players do. Tom Yore was integral for me as well. I remember him saying to me “Just because you can do a shot, it does not mean you should do the shot”. What he meant was talent doesn’t always equal victory. Structured talent is scary though, haha. Man, I remember watching hours of video of TBone(Terry Moore) and Scotty Wydman just studying both of their five man passing series. TBone could just manipulate defenses with class and Wydman had the most buttery smooth runner pass series I have ever seen. I was lucky enough to have Tommy Adkisson live in our region for some time. We became really good friends and up to this day I am still amazed by his fast understanding of strengths and weaknesses. In my eyes, he is the best ever defensively on the five bar. Up to this day he still helps me figuring strategies out. One thing I did when I came through the ranks was getting near the big matches and listen to the top players like Todd, Terry Moore, Bobby Diaz, Robert and Tommy. You can learn a bunch about a players game management, adjustments and tells player may have. Over the last 2 years it has been Robert Mares. He transferred a lot of knowledge to me and his true gift is teaching team dynamics and strategy. Those different types of drills and philosophies that I would rather not talk about (haha), really have made a world of difference in my approach to foosball. 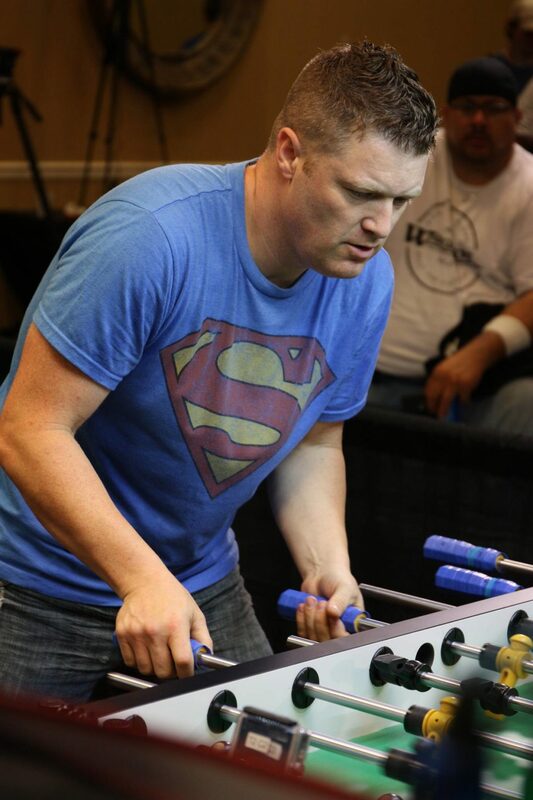 What was the biggest success in your foosball career and why? The biggest success was winning the Open Doubles at the Tornado Worlds 2015 with Robert Mares. We came from the losers bracket to win over Tony and Todd, almost certainly the strongest Tornado team at that time.They beat us for the winner’s bracket 3 straight and handedly at that. In the finals, we played strong, especially Robert which really got us into a zone. There was a point in the second set of the final, where I looked up to Robert and asked: What set is this? He said: “It’s the second set, we are up 2:0.” I was shocked and just went “Hugh! ?” in disbelief. He said:“Don’t worry about it, don’t think about it. Play your game and I let you know when it is over.” I remember the championship ball when Robert had possession on the 3 bar. I realized “oh wow, this could be it” and my hands started shaking for the adrenaline. Ryan Moore was sitting in the front row watching and I remember him noticing and laughing. We were underdogs but I could feel the support of the crowd. Man what a feeling when that last ball went in, I fell to the floor with relief. How do you cope with pressure situations? A friend of mine, Ted Scott is a caddy for a 2-time Master champion on the PGA tour. He told me something that stuck with me and helped the ebbs and flow of the game. In those moments, it all comes down to the following: Make a conscious decision to be ok with the result of full effort. If you worry about the end result, all you are going to do is stealing yourself the possibility to play your best. Focus on the match and lose yourself in the moment. Experience in pressure situations also helps you cope. If you look at the best in any sport, they all thrive under pressure, they accept it and don’t allow it to paralyze what they are capable of. Specifically taking about me, I just take a deep breath. What are the most frequent mistakes you see at the amateur level? Many amateur players tend to rush on the shooting rod and shoot the first hole they see. Also, amateur players shoot what feels good or what they think will be open instead of following a plan and adapting. On the 5 man, amateurs often pass in a less than optimal set. E.g. : the ball is not pitched back for that perfect execution. This leads to panic and lack of execution as a domino effect. How do you prepare for an important tournament? How do you keep prepared for playingduring an important tournament? I try to play as much as possible what isn’t remotely close to how much I played in the past. To keep practice interesting, I play different types of games. When I play with my daughter we play games with certain tasks. For example, we play one game only with far wall tick-tack on the five and only front pin on the shooting rods. The loser of that game gets to call the style and type of playing in the next game. Try to do things out of your comfort zone to keep the game interesting and learn different styles. As the major tourneys get closer I will also do focused training for five bar, 3bar and 2 bar. I drastically lengthen my practice sessions before the big tourneys as well. I also try to play some local tournaments for real match play. Also before an important tournament, I stop a week before it to let my body fully recover. I play better when I feel fresh. Now, once you put all that practice into being successful for the big dance (actual tournament), one of the most important things during a tournament is time management between matches. Have you ever watched a professional athlete go into the game without being warmed up? Probably not, otherwise they would provide a definitive advantage to your opponent. For optimal performance, your muscles have to be at performance temperature. Therefore, warm up properly right before a match. After a match put a jacket on, otherwise your muscles contract too quickly and can trap lactic acid which hinders performance. Besides that, I like to play 2 ball roller ball. It is a fast track to how the tables are playing and how the balls roll. It allows for fun and gets your focus for loose balls heightened. What are your favorite wraps? I like Masterwraps, the perforated ones in pink. They are thin and not too sticky, so you feel the texture of the handle better. Todd uses them as well. Is there an underlying principle for defensive play and how would you describe it? Defense sometimes even begins before the match starts. For example, I ask my opponents regularly where they are from. This will sometimes give you information about their playing style, even if you have never seen them play. This is because the players in one region oftentimes mimic the top pro of their area. The only thing you have to know is which pro plays in their respective region. For example, a player who has played against Todd Loffredo has a better than normal idea of how to block a quick long as they have probably been conditioned to block it. Therefore, analyzing the top pros gives you not only information about one player, but about every player who tries to mimic them. In this way you can start a lot of games with a defensive plan and build off of that. During a game adapt your game plan. Find out the strengths of your opponents pass and shot. Find out what defensive movements they don’t like. For example you can have a fast and aggressive shuffle or a slow invisible moving defense. If you don’t block, then change the plan. It is better to risk something than to not change a plan that does not work! Is there an underlying principle for offensive play and how would you describe it? Start out with an offensive plan and adapt it, if it does not work. When I roll the ball over in the pull shot set, it becomes apparent rather fast, if someone is comfortable blocking a pull. I look at things like, are they stiff and jumpy, are they chasing everything out on movement, do they like standard defense or is the reverse their comfort zone. I would think most top players, regardless of the shot, have something close to this style of assessment. Great players like Tony Spredeman, Ryan Moore, Robert Mares, Todd Loffredo, Frederic Collignon, Rob Atha, Yannick Correia and Billy Pappas force you to defend the entire shot clock time. They all have an offensive wrinkle. If they ask you, if you are ready, you better double check that you are really ready. Otherwise you might have to serve the ball only seconds later. (laughs) To the point of what I am saying is hold the goalie accountable to every second of the shooting clock. It’s like body blows from a boxer, you don’t see the benefits early but they pay dividends later.